About 30 km outside the North Korean capital, the Hermit Kingdom's only golf course cuts through heavily forested slopes running down to the waters of Lake Taicheng. The late Kim Jong Il is rumored to have once frolicked there on a luxury yacht. He is also famously credited with shooting a world-record 18-hole score of 38 under par  including five holes in one  on the day he opened the course. The story was reported by the rogue state's lone news service, the Korean Central News Agency, which said 17 bodyguards witnessed the round. Strangely, nobody at the course seems to recall his presumably spectacular performance. More recently, the secluded course played host to a different type of visitor: tourists. Last month, 15 foreigners and one North Korean competed over three rounds in the second Democratic People's Republic of Korea Amateur Golf Open. The tournament, organized by Dylan Harris of the U.K.-based Lupine Travel company, brought together golfers from six countries for eight days of golf and sightseeing. The experience offered a rare glimpse into one of the world's most reclusive countries  and an even rarer chance for everyday hackers to win a national championship. For most non-American visitors, the journey to North Korea begins with a train ride harking back to the mid20th century: a diesel locomotive drags boxy carriages crammed with soldiers from Sinuiju, which sits across the Yalu River from China, south toward Pyongyang. American citizens, who are only allowed to arrive by plane, miss the five hours of North Korean scenery: peasants trudging through knee-deep mud, furrowed fields and rows of squat, cement buildings. Peasants wear khaki-and-blue clothes. Red flags dot the landscape. The journey to the golf course gets you slightly off the Potemkin tourist trail, a route traveled by some 2,500 Western tourists and thousands more Chinese each year. The Kaesong Highway to the demilitarized zone near the border with South Korea, for instance, is relatively well maintained. But the nearly empty six-lane highway that runs southwest from the capital, past the Pyongyang Golf Club to Nampho, near the coast, tells a different story. The 30-km journey from the Yanggakdo Hotel in Pyongyang to the golf course can take more than an hour as a modern, 30-seat bus picks its way over crater-size potholes. North Koreans walking and cycling unhurriedly along the side of the highway sometimes move faster than the bus. Beyond them, the Pyongyang plains are covered with fenceless acres of fields where peasants, tractors and ox plow through dry, red dirt. The golf itself was an unforgiving slog across undulating fairways and incredibly slow greens. Teeing off on the first hole, players see a generous fairway bending gently up to an inviting green. On closer inspection, though, the test is much sterner, with white out-of-bounds stakes bordering both sides of the hole, forcing wayward players to replay their stroke, add a penalty and rack up high scores. Out of bounds is considered golf's ultimate design penalty, and most courses use them sparingly, if at all. There, they choke the course's entire 18 holes. 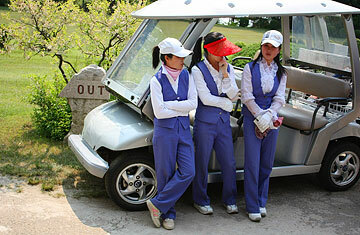 Of course, penalties off the fairway are nothing compared with the hardship endured by ordinary North Koreans. People are forced to follow a prescribed path of loyalty to their country and to the ideology of its founding father, Kim Il Sung. Those who violate the will of the ruling family face severe retribution. Scores of defectors have documented the hardships of labor camps where political dissidents are sent for even the tiniest hints of contrarianism. The sense of being under constant surveillance faded slightly on the golf course. Players were assigned female caddies dressed in smart blue-and-white uniforms and wearing golf hats emblazoned with famous brand names. The hats represented about the only signs of marketing during the weeklong trip. As players teed off in pairs, they were left to wander with just their caddies over the heavily tree-lined fairways. Occasionally, workers taking a break in the shade of trees would appear and help direct players to errant balls. The caddies provided cheering and clapping for good shots, but their enthusiasm turned to horror when things failed to go so well. At the presentation ceremony, where British photographer Simon Jones was crowned 2012 DPRK amateur-golf champion, his caddy was the envy of her colleagues as she posed with the trophy, looking like she had won it herself. Off the course, frustration comes from having no way to interact with locals and ask them what life in the Hermit Kingdom is really like. Tourists are only able to speak to official tour guides who take pride in answering all questions, no matter how fanciful the response seems. One guide said an auditorium in the Mangyongdae Children's Palace that could fit no more than 2,000 people had a capacity of 10,000, about half the space of Madison Square Garden. The only specific answer they admitted to not knowing was the age of Kim Jong Un, who has taken over the country's leading political and military positions after the death of his father Kim Jong Il. Western experts guess he's in his late 20s. But the guides insist they know little about their new leader's background. They, like the rest of the world, are wondering what comes next.